Adam Laats is an historian in the Graduate School of Education at Binghamton University (SUNY). 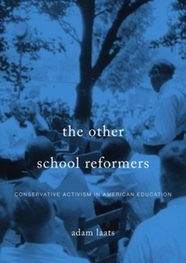 He is the author, most recently, of The Other School Reformers: Conservative Activism in American Education (Harvard University Press, 2015). He blogs about history, conservatism, and education at I Love You but You’re Going to Hell. Like Rick Perry in 2012, the Republican contenders for president this time around will also attack the education department and the Common Core. For generations, conservatives have attacked federal leadership in education as the ultimate big-government imposition. It wasn’t always this way, and we might just be on the cusp of another historic shift. In the lead-up to 2016, GOP hopefuls will burnish their conservative credentials by bashing any federal role in education. In January, Mike Huckabee dramatically resigned his Fox News job, fueling chatter of a potential presidential bid. To prepare, Huckabee backed away from the Common Core, calling the new standards “toxic.” Bobby Jindal has long been out front, loudly and proudly suing the federal government for its role in the Common Core standards. The standards, Governor Jindal accuses, will “coerce” states into accepting federal leadership in education. Most recently, Jindal released his presidential-sounding plan for education reform, denouncing any “federal meddling” in education. Even conservative candidates who like the Common Core carefully recite their loathing of any federal role in education. Jeb Bush, for example, supports the standards. But as Karl Rove noted a few weeks ago, Bush has had a hard time convincing conservatives that those standards will not impose a federal stranglehold on state and local control of schools. In recent appearances, Governor Bush has downplayed his support for the Common Core. This script has been in place for as long as there has been an Education Department. In the 1980 campaign, candidate Reagan promised to abolish the just-created department. To conservatives like Reagan, centralized education meant more than just another arm of big government. To Reagan, centralized federal control meant control by suspiciously leftist intellectuals. It implied too much influence for the likes of John Dewey and Jonathan Kozol. For later generations, it would mean too much influence for lefties such as Bill Ayers and Linda Darling-Hammond. Reagan was not the first conservative to worry. Conservative activists have battled furiously against any role for the federal government ever since the New Deal. In the 1940s, for instance, Allen Zoll swayed conservatives around the country with his dramatic pamphlets. Zoll loomed large on the rightward fringe of conservatism back then. He had influence with grass-roots conservatives nationwide as well as with emerging leaders such as William F. Buckley Jr. Zoll did not mince words when he denounced federal leadership. The government, Zoll warned, wanted to install pernicious “progressive” models in schools nationwide. Progressive education, Zoll wrote, “produced millions of little victims who know next to nothing and who have never been taught even how to learn anything.” But that was not all. The “infiltration and control of American education” by means of federal leadership was “communism’s number one goal.” The truth was plain for anyone to see. Federal control meant communism. It was not always this way. Back in the 1920s, leading conservatives actually led the campaign for the creation of a federal department of education. Most prominently, Hiram Evans backed a program to invest $100 million in a new cabinet-level education department. At the time, Evans headed the resurgent Ku Klux Klan. And though today’s conservatives might not like the company, in the 1920s Evans’s organization was wildly popular with conservative white Protestants. Unlike later conservatives, Evans felt confident that federal control would push education in firmly conservative directions. Also unlike later conservatives, Evans trusted the national education leaders of his time. It makes sense. The experts in his day included the hysterical war-time leadership of the National Education Association in 1918. Leaders of the NEA wanted new funding for schools, they said, to impose a uniform Americanization on German-speakers and other suspect groups. No politicians these days would embrace Evans’s racist vision of proper Americanism. But some conservative thinkers have begun to temper their ideas about the role of the federal government. If the experts are pushing conservative ideas, some conservatives say, then maybe more centralization is a good thing. Bennett’s support of the standards fits the historical record. As Michael Petrilli of the Fordham Institute has argued, the thinking behind these standards started back when Bennett was in charge of the federal education bureaucracy. When conservatives are the experts, the thinking goes, more federal support means more conservative schools. Could this become the new normal for conservatives? If dominant educational experts embrace conservative ideas, might conservatives become once more the party of federal leadership in education? If conservative thinkers like Bennett and Petrilli can be in charge instead of lefties like Ayers and Darling-Hammond, could conservatives change their tune? If so, it won’t happen in 2016. This sort of conservative thinking has not trickled down to the electoral level yet. Every GOP candidate this time around will have to oppose any federal leadership in education in order to prove his conservative bona fides. But we might just be witnessing the beginnings of a revolution in a long conservative tradition.